The 1965 historical war drama shot in documentary-style on the streets of Algiers is getting a high-definition release in August. 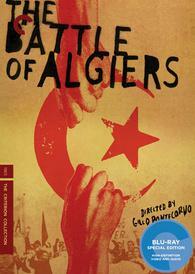 In an early retailer announcement, the Criterion Collection is planning to bring 'The Battle of Algiers' to Blu-ray on August 9. One of the most influential political films in history, 'The Battle of Algiers,' by Gillo Pontecorvo, vividly re-creates a key year in the tumultuous Algerian struggle for independence from the occupying French in the 1950s. The Blu-ray will be a two-disc set and feature 1080p video, an uncompressed mono soundtrack, and supplements include Gillo Pontecorvo: The Dictatorship of Truth, a documentary narrated by literary critic Edward Said; Marxist Poetry: The Making of "The Battle of Algiers," a documentary featuring interviews with Pontecorvo, Gatti, composer Ennio Morricone, and others; Interviews with Spike Lee, Mira Nair, Julian Schnabel, Steven Soderbergh, and Oliver Stone on the film's influence, style, and importance; Remembering History, a documentary reconstructing the Algerian experience of the battle for independence; "États d'armes," a documentary excerpt featuring senior French military officers recalling the use of torture and execution to combat the Algerian rebellion; "The Battle of Algiers": A Case Study, a video piece featuring U.S. counterterrorism experts; Gillo Pontecorvo's Return to Algiers, a documentary in which the filmmaker revisits the country after three decades of independence; Production gallery; Theatrical and rerelease trailers; and a booklet featuring an essay by film scholar Peter Matthews, excerpts from Algeria's National Liberation Front leader Saadi Yacef's original account of his arrest, excerpts from the film's screenplay, a reprinted interview with cowriter Franco Solinas, and biographical sketches of key figures in the French-Algerian War. Suggested list price for the Blu-ray is $49.95. You can find the latest specs for 'The Battle of Algiers' linked from our Blu-ray Release Schedule, where it's indexed under August 9.